Accepta 2508 is a high performance, low toxicity molybdate based cooling water corrosion inhibitor scientifically formulated for the treatment and protection of open and closed cooling water systems containing naturally soft or artificially soft water. 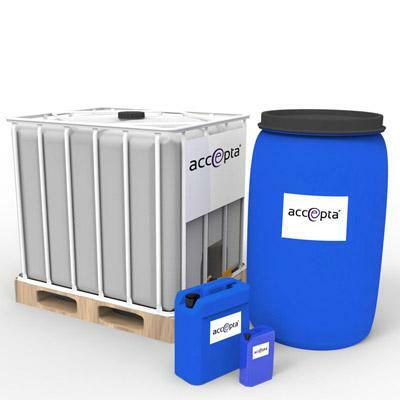 Accepta 2508 is an environmentally friendly, biodegradable scale and corrosion inhibitor that delivers superior results, protecting systems against the corrosion of steel, copper and brass, as well as containing an effective dispersant. In addition Accepta 2508 is stable to both chlorine and bromine at the levels normally found in cooling systems. Accepta 2508 should be dosed to give 100 – 150 ppm for open systems and 1000 – 1500 ppm for closed systems. It is important when starting up a new system or re-starting an existing open cooling system apply a dose of 300 ppm. Enhanced corrosion control can be obtained by back blending 20 – 60 ppm hardness into the system. NOTE – Always consider the cooling tower manufacturers control limits. Test for molybdate. Control to 5 ppm molydate for open systems and 100 ppm for closed systems. For further technical assistance concerning Accepta 2508 please contact Accepta.